The Canvas was done using various mixed media products. To start off I used white gesso and covered the canvas, I used a baby wipe to do this, I then dried it off using my heat gun. 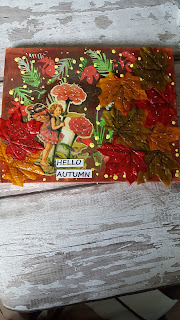 I then used 3 colours of brown acrylic paints until Igot the colour that I was looking for, the paints were all Artiste acrylic paints from Do crafts, I heat dried befor each application of a new colour. I then used modelling paste by Windsor & Newton to go over my leaf stencils on various parts of my canvas. I then used my green spray paint to spray over my leaves. After drying it I then used an orange paint to stencil more small leaves on the canvas. 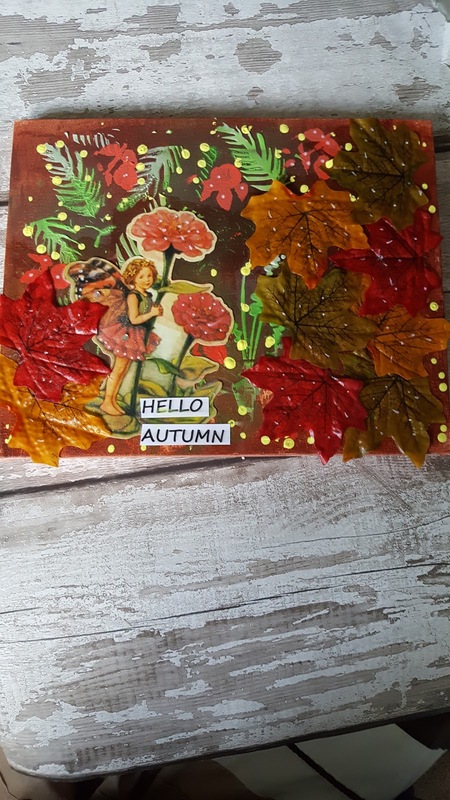 I then glued my image down using my mod podge and gluedmy various colours of leaves on to the canvas too. I then heat dried befor making some marks on too the canvas using Bananna yellow acrylic paint, I then heat dried the canvas again. Finally I added my quote to the bottom of the canvas.